I am sure we have all heard this hundreds of times ‘failing to plan is planning to fail’. I know some of you are rolling your eyes by now, but it is SO TRUE. Most of us are busy dealing with our day to day lives. Whether you are mom, running after kids or a student who is cramming school work and a job to get by, it can be a struggle to eat healthy ALL THE TIME. The constant temptation of fast food joints passing you by as you drop the kids off to soccer or the quick break you get between classes, can take a toll. This is where ‘meal prep’ comes in and saves the day! Here are the things you need to start. You will need to purchase containers of some sort. We sell some pretty amazing (for a couple reasons) Motivational Meal Prep Containers. They are BPA free, so when you reheat your food you do not have to worry about the chemicals and not worry about your container melting away. They are have 3 portion controlled compartments, two 8 oz and one 16 oz. Of course you do not need to fill up each compartment to the rim, but we have allowed some nice space! You will also need a carrying bag/lunch box. Not many out there are BIG enough and insulted to carry both cold and hot items. However, we have the perfect Motivational Meal Prep Bag. 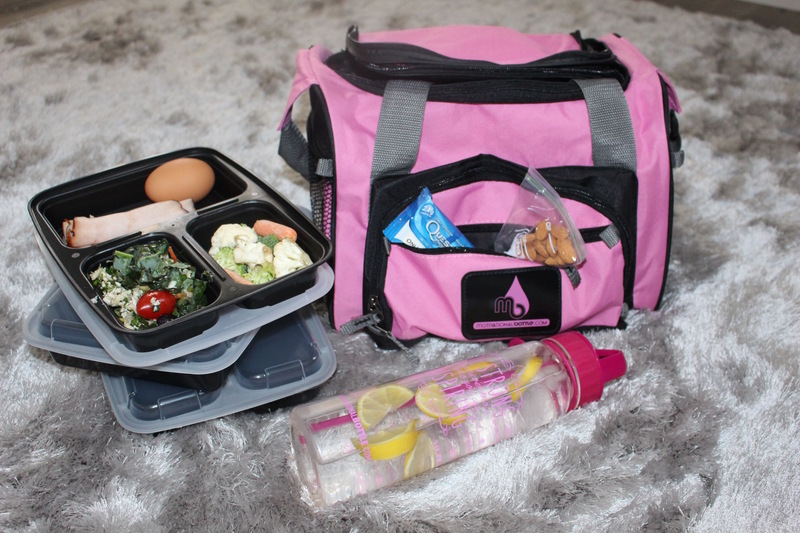 This bag can hold up to 3 of our Motivational Meal Prep Containers (each container can hold about 2 meals! ), compartments around the bag to add snacks and so much more. Go check out our containers and bag, you will fall in love. We have multiple meal prep containers available as well are meal prep bags, feel free to browse our Swag section. This is one of the most important parts before you head to the grocery store and not have ANY idea where to start. If you are a beginner to meal prepping, do not overwhelm yourself with trying to cook an entire weeks worth of 3 meals a day. It is a struggle even for the best of us. Try the first part of the week (Monday-Wednesday) and see how that goes, once you get the hang of it, go full force! Back to our PLAN this is the perfect time to sit down (grab some wine, just kidding) and jot down a schedule of your meals. Here is a quick example of what 1 meal prep day looks like: Please note, this meal routine is not for everyone. This resembles a bikini competitors meal plan. Now that you get the idea of what it should look like, switch some things around on your schedule, to best fit YOU! Remember when you are doing this, make sure that you do not eat the exact same thing each day, mix the meals up so you have fish on Monday and than fish again on Wednesday. This way you do not get bored and you can prep it all in one evening. Feel free to experiment with spices and healthy dressings. Bland food will make this torture, ‘spice’ up your veggies with some curry or your chicken with some low sodium teriyaki. I have found that I eat a lot more difference foods when I prep, because I tend to venture out and get all chef like in the kitchen (hehe). Need help picking the perfect essentials to get on your meal prep journey?